Authorized dealer for Demag & Jet, and suppliers of Stahl, Power Supply, and more! Demag is the world market leader for materials, handling components, cranes, hoists and supplies & innovative product solutions. 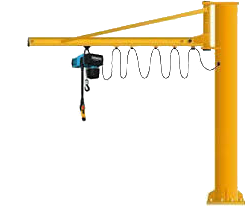 Wire rope hoists from Stahl prove themselves every day in heavy usages and consistent development. Jet prides itself on their loyal base of customers, manufacturing partners, and end users. Using their ‘one-stop-shop’ approach, they have developed a comprehensive product offering.